The world of rifles today has a number of optical sights options like never before. The Burris MTAC 1-4x is an all-rounder of sorts when it comes to riflescopes as it can be used for 3-Gun, close quarter battle, and hunting of dangerous game. It is well-built and rugged enough to survive any tactical situation and offers the best in mid-range precision. From bold, illuminated reticles to crystal clear multi-coated lenses to a single tube design, the MTAC has all the features of a well-designed close to mid-range riflescope. It also comes from a reputed brand such as Burris, that is known for its experience in making good quality riflescopes. Read our Burris MTAC 1 4×24 review below as we piece together the capabilities of this riflescope, so that you can decide if this is the right one for you. Magnification range of 1 – 4x is ideal for 3-gun and big-game hunting. An illuminated reticle for quick shooting of target even under low light or overcast conditions. The 24mm objective lens is recessed 1.5 inches and hence provides protection from sunlight. High quality hilume multi-coated lenses for a crisp and clear image under all light conditions. 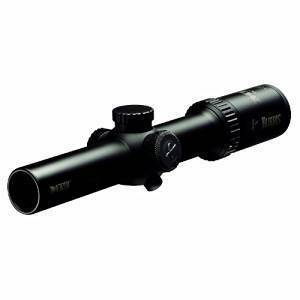 The scope is a single 30 mm tube that is made of aircraft grade aluminum to withstand rugged handling. Exit pupil is 24 low – 32 high (mm). Elevation adjustment is 130 MOA. Capped turrets to prevent accidental rotation. It has a maximum adjust of 130 inches at 100 yards. An ergonomic power ring lets you change the settings with ease. Riflescope weight is 17 ounces. Why is the Burris MTAC 1- 4x the best? The reticle is a large circle with a series of four vertical dots and three T-shaped bars around the topmost dot. This set-up allows for a quick aiming for close-range shooting and is also equally effective for longer distances. The reticle is illuminated, so even when you are shooting in overcast weather or low light conditions, you will be able to quickly aim at your target with ease. The combination of a bold reticle that is illuminated is a favorable feature, especially for weary eyes or for aged shooters. The reticle of the MTAC is also etched, so that you even if your battery runs out, you can still use it. In fact, some users on Amazon ( See what amazon customers say ) feel that in very bright light conditions, it is better to use the scope without any illumination. The lens is one of the best you will get at this price point and is the best feature of this riflescope. The lenses are made of precision ground optical glass that is index-matched and multi-coated with Hi-Lume for extremely sharp and clear images. Enjoy glare-free viewing in bright-light or see clearly under low light conditions with these superior quality lenses. The MTAC is well-built with a 30 mm tube that is made of aircraft grade aluminum making it really strong and light at the same time. Not only is the scope strong enough to survive harsh shooting environments, but it is also moisture-proof as the inside of the scope is filled with Nitrogen to keep it fog-free during rain and snow. The tube is also sealed with unique Burris quad seals, making your scope completely water-proof. 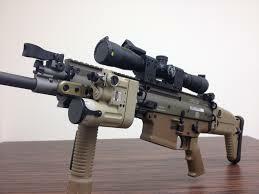 When you have to shoot rounds after rounds, your scope will experience impact from recoil and vibrations. But the MTAC comes with a double internal spring-tension system that makes it sail through every recoil, shock or vibration without any loss in performance. They hold the optical system in place and offer the best in accuracy. Illumination reticle – The bold and illuminated reticle comes with 10 adjustable illumination settings to suit every light condition. Large eyebox – The MTAC has a really large eyebox at 1x magnification and hence can be used to shoot with both eyes open. Good eye relief – The scope also gives a good eye relief and also has a wide angle of view. No fish eye – Unlike other low power scopes that have a ‘fish eye’ problem when on the lowest magnification, the MTAC, owing to its crystal clear reticle does not trouble you with ‘fish eye’ at any of its magnification levels. High-quality index-matched lens – allows for clear and bright images even under low light conditions. The scope works as a red dot when used for close range shooting. The MTAC has relatively large dots and may not be for those who prefer a smaller dot for shooting close range targets. The zoom ring seems very hard to turn when it’s new but gets better with use. Any optical needs protection from external damage like scratches and dust, but this riflescope does not come with a lens cover in the box. The Burris MTAC 1-4x is a great scope for tactical and competition use. If you are looking for a scope that is great for defensive shooting out to 600 yards, then the MTAC will be a great buy, especially at its price point. You will experience an optical performance that is superior and comparable to top-tier scopes. You don’t have to buy a separate red dot and a riflescope because when you buy the Burris MTAC, you can get both these functions in one. The aim of this Burris MTAC 1 4×24 review is to show you how good a riflescope the MTAC is, for close range shooting and decent mid-range shooting. 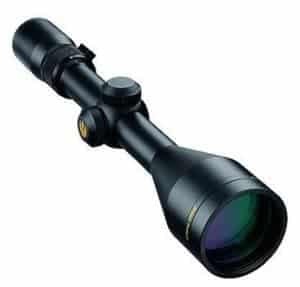 With a true 1:1 magnification at 1x, clear images even at its top 4x magnification and a well-built frame, it has all the features of a premium scope giving you more bang for the buck.